This post is sponsored by Curiosityville and The Motherhood. All opinions are 100% mine. I just said goodbye to my first graders for the summer! The last days of school are always bittersweet. I have developed great relationships with my kids and I want only the best for them. One thing that I constantly tell my students is that learning shouldn’t stop when they leave the classroom. I am asked time and time again for quality educational resource recommendations for my students. Parents are looking for something that will fit their child’s skill level as well as challenge them in areas that they need to be challenged in. Finding quality resources is more difficult than one might think. First, the student needs to be engaged in the program. Second, the program needs to understand that children learn in a variety of different ways. Finally, the program needs to give parents data about what their child is learning as well as what their child needs help with. It is a tall order. A few weeks ago, I was introduced to Curiosityville. Curiosityville is a fantastic, research-based, personalized learning website for young kids and their families. The site engages early elementary and pre-K kids in educational games that have the added benefit of allowing parents to monitor their progress and learn about their own kids’ learning styles. I found the program easy to install on my laptop. My four year old son can find it easily on my bookmark bar and login is a breeze. When he first logs in, he is able to choose a character to play with. Each of the five characters have different jobs and personalities. Jonah loves Jack, the chief of police! I am personally fond of Ruby, a very curious kitty who happens to be a teacher! 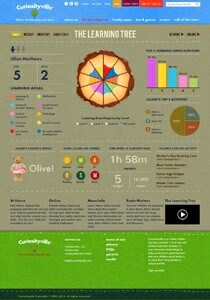 What sets Curiosityville apart from some of the other educational platforms I have used is The Learning Tree. The learning tree gives parents a quick snapshot of what their kids are doing in the program, what type of learning your child is and what activities they like to do. In addition to the Learning Tree, parents also have access to recommended activities based on their child’s performance and specific to how they like to learn! As a teacher and a parent I love this feature. Having activities created specifically for how my child likes to learn is a fantastic resource. It helps cut through a lot of guess work and time searching for activities and resources. My son has been loving the picture matching game. I have a few students who I know who spend most of their time playing checkers with Jack! There are a large variety of activities perfect for all types of learners. Most importantly, my child loves Curiosityville. He is actively engaged with the program and I can tell that he is having a great time. I have learned that half of teaching a child is to engage them in whatever you want them to learn, Curiosityville understands that. This program is a fantastic resource for children over the summer months. We need to keep their brain’s sharp during the break so that they come back to school seamlessly. To learn more join the Curiosityville Twitter Party on Monday, June 4th at 1pm EST. Join in on the fun with the hashtag #Curiosityville. You can also visit their website and try it risk free for 1 month! I hope to keep my 5 year old academically engaged this summer and this looks like the perfect way to do it. He’s a bright little guy and I don’t want him to have that transition period at the beginning of the year, I want him to be able to jump right in! Thanks for the info. My preschooler would love this… and his little brother will soon be old enough to enjoy it, too. Summer break is always hard because all you want to do is go outside and enjoy not read so getting kids actively curios is always a great tool. Thanks for sharing this.